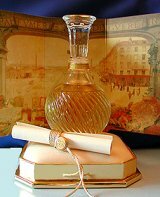 Guerlinade is the accord that was used as a "house signature" in all of the classic Guerlain perfumes, and in many of their modern fragrances as well. It was developed by Aimé Guerlain, the creator of Jicky, and is said to contain bergamot, rose, jasmine, tonka bean, iris, and vanilla. Guerlinade starts with deep bergamot over lilac. There is the tiniest whisper of linden, which fades as the rose and jasmine intensify. The jasmine is strong and slightly animalic in the early dry down, but once it settles, the floral notes are very well-blended, and smoothed by a soft, powdery iris-vanilla accord in the base. The floral arrangement has an old-fashioned, very feminine feel that pays tribute to Guerlain's long history, and as you would expect, it smells like it was made with better quality materials than most firms bother with. All the same, it is a considerably brighter and cleaner fragrance than the classic, hard-hitting Guerlains. The dark, animalic undertones of its forebears, like Jicky, Shalimar and Mitsouko, are held in check — in other words, there is none of the stuff that now strikes many consumers as "musty" — and its modern sensibility is made very clear if you wear it in tandem with any of those fragrances. Guerlinade is slightly more casual, and slightly less sensuous, which may or may not be a good thing depending on your outlook. Guerlinade was recently re-released, and is now available at the Guerlain boutique in Paris, and possibly at the Roja Dove boutique in Harrods as well. I was thrilled to hear the news as I liked it very much when I first tried it, but there were no bottles to be had. Of course, as soon as it became available, I started to vacillate. I still cannot make up my mind whether I love it enough to buy a whole bottle. Probably by the time I decide, it will be gone again. Update: I should have mentioned that I am 99.9% sure that Guerlinade is now packaged in the standard Guerlain bee bottle, and not the lovely packaging shown above. Update 2, 10/06: Guerlain announced in the fall of 2006 that Guerlinade was to be discontinued. GASP!!! You don't like Guerlinade enough to buy it, R? Oh, I love it! I received a sample several years ago in a swap package. I sampled it and did not think much of it. Then, after a few weeks I sampled it again and went crazy. I bid for and won an original bottle from an eBay seller over two years ago. And now, my Guerlinade holds a special place in my fragrance collection. I love its clean, fresh accords and lasting power. Like R, I love Guerlinade and I have a bottle. However, I made an observation that I rarely reach for it these days. Instead, my hand moves to the classical Guerlains over Guerlinade. Still, your review describes it perfectly. I may have to revisit today. R, I really thought I did love it that much, and was planning to find someone to split a bottle when it came out. But my bar is much higher these days, just because I have way too many bottles. My new rule is to try not to buy until I run through a decant, and my decant of Guerlinade is not empty because despite how pretty it is, I just don't reach for it often. Truth be told, I only very rarely drain a decant of anything! I have too much!! I have too many bottles I don't reach for as often as I'd imagined I would. I find “the one” and as soon as I get it I'm off on another chase. Like Pierston in Thomas Hardy's The Well-Beloved, my ideal has a constantly shifting shape and moves from one bottle to the next. I liked Guerlinade, I've never met a Guerlain I didn't like, but could not justify the expense of buying a bottle to sit and be admired. Pretty, beautiful, but not the “one”. Oh, how I am dying to try this. If there is “none of that stuff” that prevents me from being able to wear Shalimar and Mitsouko and even the beloved L'Heure sometimes…this well may be a Guerlain for me…I am afraid to even ask…how much does a bottle cost? C, yes, that is it, it might not be “the one”. But I have met Guerlains I didn't like! Several, in fact. M, what about Apres L'Ondee? It doesn't have “none of that stuff” neither! I found out the price right when they re-released it, but of course now I've forgotten. It wasn't cheap, and IIRC it was only in large bottles. Why did I have to read this? Yet another Guerlain I haven't tried and that sounds divine. My one hope is that I really do love the dark, musty accord in the classics. Still…I worry I'll be calling the Guerlain boutique in my sleep and ordering a bottle unsniffed. The AAs are not inspiring, but are likeable. There are plenty of Guerlains I do not care to own, but none that I've found truly unappealing. Even Mahora. LOL. R, I don´t know Guerlinade, so I cannot say anything about it. I´m just discovering Guerlain fragrances, so far I tested Jicky, Mitsouko, Après l´Ondée & my personal favourite – I can imagine you don´t like it very much – Shalimar! I had tried it several years ago & detested it, but now I´m in love ;D It´s surprising how tastes can change! When I start calling boutiques in my sleep, I'll have to have the phone lines cut off! Shalimar is lovely, although you're right that I prefer Shalimar Light! The original parfum was my step-mother's signature scent, and always reminds me of her. Hi R! Great review. The relaunched version comes in bee bottles with terrible pump sprays. I like it and like you not enough to buy a bottle – may get another perfume like Liu instead. I found Guerlinade in Heathrow duty-free years ago, and was so utterly bowled over by it that I shelled out what was for me an astronomical sum to buy it – presentation bottle, box and all. I think it's the classiest scent I own; I still have half the bottle because I've been too scared I run out and can't get more. Strangeley, it reminds me of SL Un Lys – and your mention of lilac makes me wonder if this common note is why (because Un Lys is SO lilac at the beginning). Gorgeous stuff – and I'm not Guerlain's biggest fan. Always wondered about this one but never smelled it. Thanks for the review! N, terrible pump sprays, really? Well, then I'm glad I don't need to buy it! N, you are so lucky to have that beautiful bottle. Even the box looks gorgeous. Will have to try it next to Un Lys! T, maybe it will end up at Bergdorf Goodman, who knows. K, sometimes the reading is better than the smelling, no doubt! I really like this and still have a big decant from former days. I actually spilled my first decant all over myself, thinking the top was on securely when it was not. My jeans smelled heavenly through a couple of washings ;D. Luckily, the person who sent me the first one took pity and sent another. Hmm, I'll have to wear some today, now that I think about it. Thanks, NSt! L, there is nothing more infuriating than spilling a whole decant. Have done it twice. Glad you got another! R., thanks for the great reveiw – I have always wondered what components were in the Guerlinade that underlies most of their fragrances. Unfortunately there are very few Guerlains that smell good on me. The “musty” smell is what seems to come out most strongly on my skin. Shalimar isn't musty but is waaay overpowering on me. Nonetheless I admire the history & artistry of their perfume, and have bought some AA's as consolation. The guerlinade on its own sounds wonderful though – lilac? hmmm… that's something I'd love a whiff of. I don't think you would find Guerlinade musty at all, and also — have you tried Apres L'Ondee? It is much lighter & brigher than many of the other classic Guerlains. R., I have heard so many good things about Apres L'Ondee and am dying to try it. Unfortunately I can't seem to locate it in any retail stores. I've searched high and low and no one seems to carry it! This surprises me as it seems to be a classic along the lines of Mitsouko or L'Heure Bleu. I may have to order a decant online to try it out. I love the citrus too, my favorite is the oakmossy Eau de Guerlain. HI, I see GUERLAIN GUERLINADE PERFUME on Ebay my girl 25, Will this smell good on 25 year old girl? Hi, there will you delete this massage too? Iam sorry about ebay Item # . I didnt know the law here about ebay Item #'s. I don't see why it wouldn't smell good on a 25 year old girl, but if she likes very modern-type fragrances, it might not be her style. There's a bottle on eBay right now for those of you who love it. I was looking for one, and it was the only one I could find on the internet. This one is a little pricey for me. Does anyone know of a source for Guerlinade? They did relaunch it for a time, but don't know if it is still around. If it is, Bergdorf Goodman in NY would be your best bet.